Lux Moving and Storage is proud to service West Palm Beach and its surrounding cities. With over 25 years of combined experience in the industry, our team of experienced movers are ready and able to provide luxurious local, long distance, commercial and international moving services. Our philosophy goes beyond simply packing/unpacking, moving and furniture deliveries; we surround our entire moving experience on the notion that each and every one of our customers will experience the highest level of luxury. This treatment includes only the highest quality level moving equipment, materials and tools needed to get the job done right! As a reliable and honest moving company, we take pride in the fact that our loyal customers stay with us for a lifetime. Our services speak volumes. We value the fact that our movers are top-notch, ensuring our staff is qualified, honest, and reliable individuals that you can trust! We cater to you! Whether you are local or across the country, our relocation services get you to your destination in a fast and timely manner. Need to know how much your move will cost up front? Just ask our moving specialists or fill out our quick estimate form. We can help! Your agent can guide you through optional services such as packing, unpacking, deliveries, storage and staging, or even moving your vehicles. 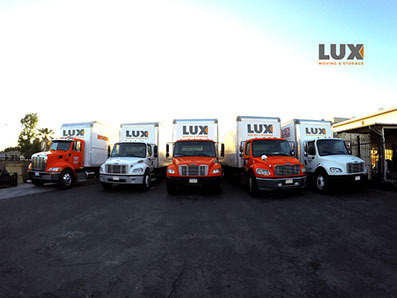 As a company committed to serving our customers with the highest level of service, we promise to always serve you as if you are royalty at Lux Moving and Storage. We have established a set of core values that we live by. Treat everyone as if they were royalty. Care: To have compassion for others.